or more accurately what I have learned about Tuscumbia Landing will follow. Tuscumbia was a thriving little town back in its day. It was a very wealthy town which afforded the rich to send their children away to boarding schools while the not rich’s children attended the public schools. I guess it could be said that there were the 1% and the 99%, then as now. The Shoals area has most every natural resource to be productive including recreational pursuits. A huge boon to the economy that caused the town to explode with wealth and all that comes with it was the Landing at Tuscumbia. made the export of products and goods, such as cotton very efficient for the time. What is left of Tuscumbia Landing will have to be searched for by all but those intimately familiar with the area; and who know what to look for. The original Landing at Tuscumbia aided in the removal of the Creek native americans during the 1838 removal of them all to reservations in Oklahoma if they survived the trip. This was the Trail of Tears. The government mandated that all native americans be rounded up and they were marched forcibly away from their home, culture and way of life. The original landing dated back to the 1820s and as a dock for the steamboats brought great wealth to a number of Tuscumbia and Shoals area citizens. Tuscumbia Landing, Sheffield is at the confluence of the Tennessee River (Pickwick Lake) and Spring Creek, near the foot of Blackwell Road, west of downtown Sheffield, There is much historical significance attached to the two Landings. 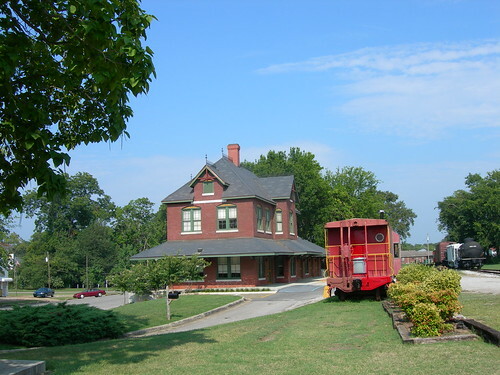 Tuscumbia Landing was at the western terminus of the Tuscumbia, Courtland, and Decatur Railway. During the summer of 1838, Cherokee detachments headed by Lt. Edward Deas and Lt. R.H.K. Whiteley attempted to travel from Ross Landing, Tennessee to Fort Gibson, Indian Territory via the “water route.” These detachments floated down the Tennessee River to Decatur. Due to low water and potential difficulties navigating through Muscle Shoals, they rode on the railway west to Tuscumbia Landing and then boarded boats headed downriver. Prior to that summer, numerous other “water route” detachments brought Creeks, Choctaws, and other groups past this spot on their way to Indian Territory. Tuscumbia Landing was also the site of considerable Civil War activity. One reminder of the second landing is a historical marker describing Tuscumbia Landing’s role as home to the first railroad, named the Old Tuscumbia, Courtland, and Decatur (TC&D), west of the Appalachian Mountains. The second landing was built to be accessed by the railway system. The marker may be at the corner of Fifth and Water. All that remains of what was once Tuscumbia Landing are some limestone pilings that once held up the pier. second landing was constructed up river from the original one. That same year, the Tuscumbia, Courtland, and Decatur Railroad united with the Tuscumbia Rail Road Company, and the railroad spur to Decatur was completed in 1834. The site’s significance proved to be its downfall when the railroad depot was destroyed during the Civil War. 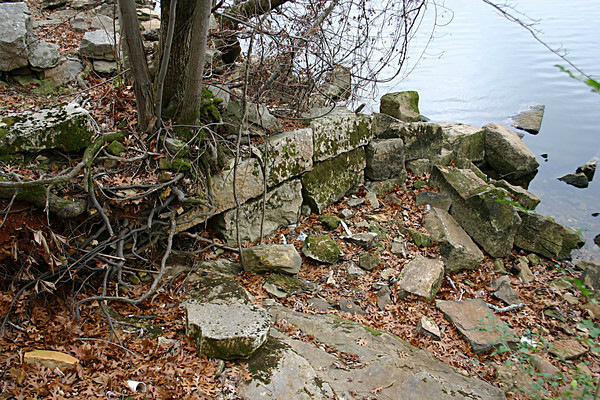 Remnants of the limestone blocks used for a pier for steamboat arrival and departure are all that remain of the original landing dock. If you did not know what to look for, you may not recognize the landing’s importance in Shoals area history. Northwest-Shoals Community College’s Tuscumbia Landing archaeological research and planning projects with government funding and with myriad connections to surface transportation, project coordinators were able to assemble TE funds to identify remaining historically significant archaeological features. Perhaps future research might include NWSCC findings. Tuscumbia Landing was named a Certified Historic Site on the Trail of Tears National Historic Trail in 2007. Historic marker commemorating the first railroad. The Landing of Tuscumbia first serviced steamboats and later a second landing serviced the railway system. in history. Quite a few influential people were born, or lived in the Shoals area. Among them were the Rand family. They lived in Tuscumbia. Carl Rand lived at 501 East Third Street. His homeplace housed some tools used in antebellum times. 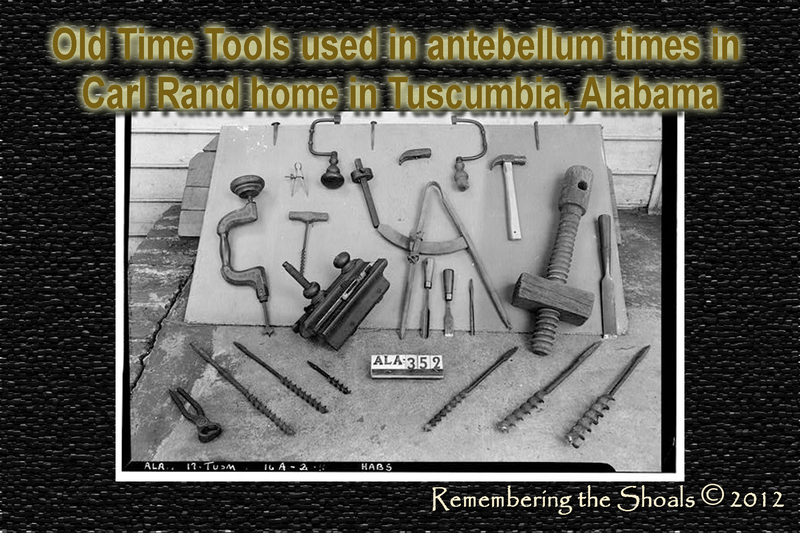 Below is a photo from the Library of Congress that shows some of the classic tools used in the early days of the Shoals. as it pertains to Tuscumbia, Alabama in the year 1888. This is one of the oldest towns in Alabama, with a history full of interest to those who are the descendants of the pioneers of the Tennessee Valley, as well as to the student, who can find in its pages the record of adventures as thrilling, and achievements as heroic, as any that have been depicted by either historian or novelist. This sketch, however, will be confined mainly to chronological events and statistical matters connected with the settlement and development of Tuscumbia and the country immediately surrounding it. As far back as 1780, the French Colony on the Wabash River established a trading post at the mouth of the Occocoposo, or Cold Water, Creek on the Tennessee River, about one mile from the northern limit of the present site of Tuscumbia. This creek runs through the town, and is the outlet for the immense spring which rises from the earth near the center of the town and flows in a circuitous route to the Tennessee River two miles away. It affords a fine power for mills and factories, and has been utilized as such for many years. Professor Toumey, in his “Geological History of Alabama,” gives the measurement of this spring at 17,724 cubit feet of water flowing from it per minute, or enough to furnish every person in the United States about four gallons each per day. The temperature is 58 degrees, and although strongly limestone it is pleasant to drink. At the time of the establishment of the colony alluded to at the mouth of Spring Creek, Nashville was the most important trading station in the Southwest, and was not exempt from hostile incursions by the Indians, who held the country from the Alabama River to the Cumberland. For a number of years depredations by them upon the Cumberland settlements were frequent and destructive. In the early part of 1787, Col. James Robertson organized an expedition, which descended the Cumberland and ascended the Tennessee, as far as the mouth of Duck River, but at this point he was defeated and forced to return. In June, 1787, he started on a second and more successful trip, marching south from Nashville with 130 men to Bainbridge, a small village on the Tennessee, about ten miles from Tuscumbia. Moving from this point westward, along the south bank of the river, he found the Indian village, at or near the mouth of Spring Creek, or Occocoposo, as it was then called. The Indians, and their French allies, retreated to a strong position, a short distance up the creek, where Robertson attacked, and defeated them with heavy loss, and destroyed their village and captured the trading post and a large quantity of supplies. In 1802 General Wilkerson made a treaty with the Chickasaw Indians, whereby he secured from them permission to cut out a wagon road from Natchez, Miss., to Nashville, Tenn., crossing the Tennessee River at Georgetown, twenty miles below Tuscumbia. In 1814 Gen. Andrew Jackson and Col. Benjamin Hawkins were empowered to make treaties with the Indians, with a view to securing some of the vast and fertile territory then held by them. In the fall of 1816 they granted to the United States all the territory from the headwaters of the Coosa westward to Cotton Gin Port, Miss., and thence north to the mouth of Caney (now Cane) Creek on Tennessee River, ten miles below Tuscumbia. The first white family to settle in Tuscumbia was that of Michael Dickson in 1815. Soon afterward, four of his brothers-in-law, from Smith County, Tenn., Isian McDill, James McMann, ____ Matthews and Hugh Finley, arrived. The following year, 1816, was remarkable for an unprecedented drought, which prevailed all over this territory. Capt. Jno. T. Rather, who died in Tuscumbia a few years ago, when nearly ninety years old, often spoke of the distress of the people on account of the scarcity of breadstuffs at that time. Corn sold at five dollars per bushel. The nearest mills were at Huntsville, Ala., and Mt. Pleasant, Tenn., about seventy miles distant, from whence all of their meal and flour was hauled in wagons. The first white child born in Tuscumbia was Miss Anna Dickson, who married Dr. W. H. Wheaton, who died in Nashville since the late war. She was living but a short time ago. Hugh Finley was a blacksmith, and owned the first shop opened in the place. In 1816-17 quite a number of families arrived and settled in the present limits of Tuscumbia, which was then known as Big Spring. Col. James McDonald was afterwards appointed Postmaster for the Big Spring office. He was a distinguished officer of the United States Army, having won distinction in the battles of Chippewa and Lundy’s Lane, and came to Tuscumbia from Knoxville, Tenn. He was joined here by his brother-in-law, David Keller, from the same place, and both moved to Russell’s Valley, remaining two years, when they returned and purchased farms near Tuscumbia. Colonel McDonald died on his farm, “Glencoe,” in 1827, and Mr. Keller, having sold his farm and accepted the office of Superintendent of the Tuscumbia & Decatur Railroad, died ten years later. Mr. Keller and a man named George Miller, from Fayetteville, Tenn., owned the first stocks of goods ever sold in Franklin County, or rather in the territory afterwards embraced in the county. Col. Thomas Hindman, father of Gen. Thos. Hindman, of Confederate fame, brought Mr. Keller’s stocks from Knoxville, and sold it out at York Bluff, on the present site of Sheffield. In 1817 a battalion of United States soldiers arrived at Tuscumbia, and began the work of cutting out a new wagon road from Nashville, Tenn., to Columbus, Miss., called the Military Road. This was done under General Jackson’s supervision, and the point at which he crossed the Tennessee is now known as Jackson’s Landing, in the limits of Sheffield. About this time General Jackson purchased the large tract of land lying between the river and Tuscumbia and upon which the larger part of Sheffield is now located. In 1816-17, a number of families located at York Bluff, which was laid off by General Coffey in 1820 as a city, with broad and regular streets running north and south and east and west. This town was soon abandoned, its citizens moving to the more prosperous town of Tuscumbia, and had not a house left when Sheffield was formed, to tell where a town had been. 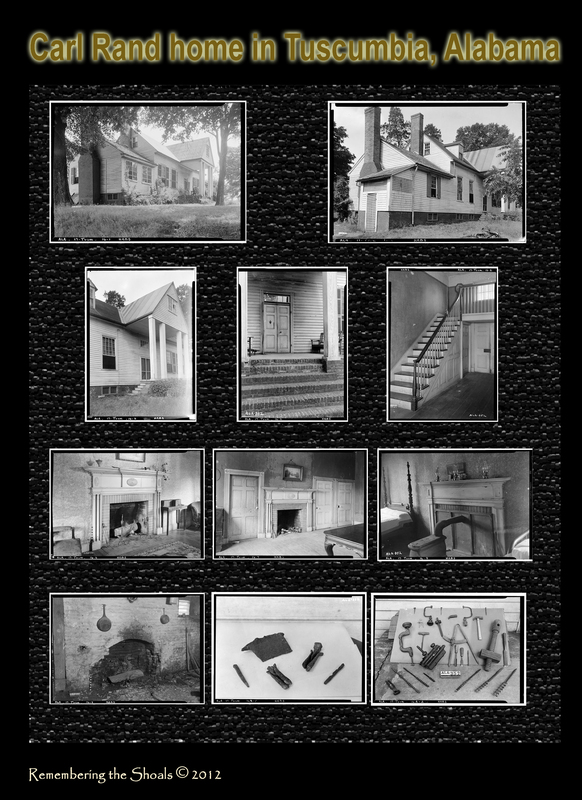 Mr. Miller, who first sold goods at York Bluff moved to Tuscumbia and built the first brick house, now known as the Glendall House on Sixth street, in 1819. He afterwards moved to West Tennessee and died there. Tuscumbia was surveyed and laid off as a city by General Coffey in 1817. Its limits were a mile and a half east and west and a mile north and south. None of the streets are less than ninety-nine feet wide, and the commons on the margin are much wider, that on the north being 334 feet. These streets and commons were dedicated by the Government for the use of the citizens of Tuscumbia, and the Supreme Court of Alabama has decided that the fee to them is still in the Government and they can not be disposed of by the city authorities. In March, 1817, Congress passed an act establishing the Territory of Alabama. At that time only seven counties had been organized in the Territory. These were Mobile, Balonni, Washington, Clark, Madison, Limestone and Lauderdale, and they had been organized under the territorial government of Mississippi. Upon the assembling of the Territorial Legislature at the town of St. Stephens, Franklin County was organized, but the act provided that the jurisdiction should not extend beyond Cane Creek, ten miles west of Tuscumbia, that being the boundary line between the lands granted by the Indians and those reserved by them under the treaty of 1816. The lands west of Cane Creek were held by the Indians until they were removed beyond the Mississippi in 1836. 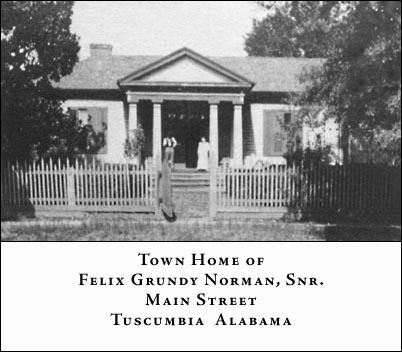 The first superior or circuit court ever held in Franklin County was at the house of William Neeley, on Spring Creek, a few miles southeast of Tuscumbia, September 7, 1818. Obadiah Jones was judge, Henry Miner, district attorney, and Richard Ellis, clerk. The grand jury was composed of William Neeley (foreman), Jacob Humble, William Welch, Andrew Blackmoor, Strange Caltharp, John Bell, Goldman Kimbro, Isaac Pickens, Argyle Taylor, James Wilex, Pryor Landsford, Matthew Maree, Matthew Gwynn, and William Scott. For lack of a room large enough, the court adjourned to the house of Michael Dickson, at Cold Water (Tuscumbia). Anthony Winston was the first representative from Franklin County, in the Legislature. He was the grandfather of Col. John Anthony Winston, who was Governor of the State afterward. He was raised in Tuscumbia. Robert B. Lindsay, Esq., of this place, a native of Scotland, and a brother-in-law of Governor Winston, was elected Governor of the State in 1870. Tuscumbia was also the former home, if not the birthplace, of two United States senators. Robert Ransom, the father of Senator Matt Ransom, of North Carolina, was one of the early settlers of Tuscumbia, and opened the hotel called the Franklin House. Thomas Hereford, father of the West Virginia ex-Senator Hereford, was also a hotel keeper here, and was proprietor of the Mansion House, near the Big Spring. Ex-Senator Henry S. Foote also commenced his career here as a lawyer and editor, and fought a duel with Edmund Winston, an uncle of Governor Winston. Tuscumbia has also had a representative in the lower house of Congress, in the person of Major Joseph H. Sloss, now of Huntsville. Upon the assembling of the first Legislature of the State, at Huntsville, on the first Monday in October, 1819, a bill was passed, incorporating the town of Occocoposo (now Tuscumbia). Thomas Limerick was appointed mayor, with Philip G. Godley, Micajah Tarrer, Abram W. Bell, and Littleton Johnson, aldermen. At the next session of the Legislature, the name of the town was changed to Big Spring, and, the following year, to Tuscumbia, after a celebrated chief of the Chickasaws. 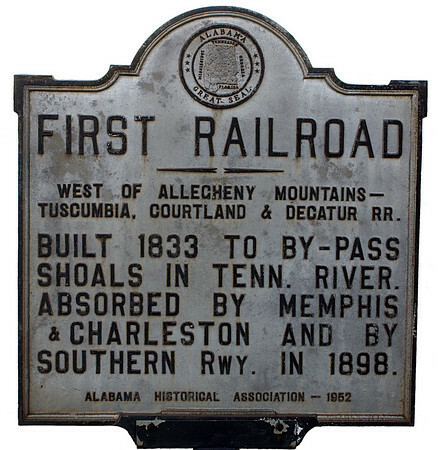 The first railroad that was built west of the Alleghanies was that from Tuscumbia to the Tennessee River. It was commenced in 1831 and finished in 1832, and was two and one-eighth miles in length. In 1834 it was merged into the Tuscumbia & Decatur Railroad. For twenty-five years after this road was built there was an immense trade done with New Orleans by the river. Magnificent steamers ran to that place, some of the carrying 6,000 bales of cotton. They were palatial in their appointments and accommodations for passengers. Parties in search of pleasure could find no pleasanter nor more enjoyable pastime than an excursion on one of these elegant boats to the Crescent City. Other steamers ran regularly, as they now do, to the cities on the Ohio and to St. Louis; but the New Orleans trade was broken up soon after the completion of the Memphis & Charleston Road in 1857, which road bought the Tuscumbia & Decatur Road, and abandoned the branch to the Tuscumbia Landing. For a number of years previous to the great financial crisis in 1837, Tuscumbia did a large wholesale business. Most of this was done in two rows of brick storehouses known as “Commercial” and “Planters’ Row.” The latter was destroyed by fire about the year 1837. The former is still standing, all of the stores being occupied and in a good state of preservation. 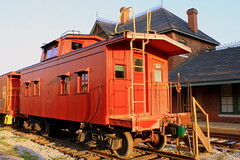 A street railway from the depot to Main and Sixth streets, for the delivery of freights, was built in 1834. Until the completion of the Memphis & Charleston Railroad the Tuscumbia postoffice was a distributing office, and probably the largest and most important from Nashville to New Orleans. A number of state lines converged here, which were owned by such veteran stagers as Patrick, Ficklin, Chichester, and others. The immense warehouses at the Tuscumbia Landing, which were constructed of stone and brick, were burned in 1862 by Turchin’s Brigade of Mitchell’s Division of Federal Troops. In its former and better days, probably no town of its population in the South had more wealth in its immediate vicinity; but that did but little towards building up the town. The planters bought their supplies in New Orleans and Louisville, and sent their children abroad to be educated, leaving only the poorer classes to do their trading at home. In the fearful struggle between the North and the South—1861-5—there was no part of the South more completely devastated than was the beautiful Tennessee Valley. Tuscumbia was in the center of the fiery, desolating track of the armies of both sides. Large blocks of brick stores and many private houses were destroyed and condemned. Cavalry horses roamed at will through grounds that were formerly the pride of their owners. Upward of thirty of Tuscumbia’s young men were killed, and for years after the sound of battle had died away she sat on the ashes of desolation, waiting for the dawn of a better day, which, although long delayed, has come. The giant young city of Sheffield has stretched her limits to within half a mile of her gates, and she has caught the contagion of progress and enterprise, and within the last two years has doubled her population. She is experiencing some of the doubtful effects of a hot-house boom, but observant and far-seeing men recognize the fact that she has every natural advantage that any other place in Northern Alabama has, and that which money can never secure. Her society is as good as can be found anywhere. She has churches of all denominations and first rate schools. The Deshler Female Institute stands in the front rank of Southern schools. It stands as a monument to the memory of Brig. Gen. James Deshler, of Tuscumbia, who was killed at the battle of Chickamauga. The sum of six thousand dollars has been voted by the City Council to enlarge the free school for white males, and the rapidly increasing revenue from taxes will amply justify the expenditure, and support the school. Tuscumbia challenges comparison with any town in the South as to its healthfulness and exemption from epidemics. An examination of the tables of mortality for the last twenty years will not show an excess of one per cent, per annum, as the death rate, including both black and white. Where parties desire to engage in business at Sheffield, they can reside at Tuscumbia and avail themselves of the convenience of two “dummy” lines to reach their business in a few minutes. Real estate, although greatly enhanced recently, is still comparatively cheap. A water works company has been organized to supply East Sheffield and Tuscumbia from the spring, and gas or electricity will speedily be introduced to light up the streets. The Presbyterian Church.—This church was organized in 1824, by Rev. Dr. Blackburn, of Frankfort, Ky., and the church building now standing was commenced and completed in 1826-7. For several years the large frame building near the spring was used for church services. Rev. Dr. Campbell was the first pastor of the church, and Messrs. Arthur Beatty and James Elliott were the original elders, with Susan Winston, Elizabeth Johnson, Ann Beatty, A. W. Mitchell, Eliza Mitchell, and Sarah Mitchell as members. Soon after this Rev. G. W. Ashbridge, of Philadelphia, Pa., took charge of the church, which received many additions from this time own. Mr. Ashbridge was pastor from 1827 to 1830; Mr. Arnold was pastor from January 1, 1831, to June, 1831; james Weatherby was pastor from 1831 to 1837; J. O. Steadman was pastor from 1837 to 1845; N. A. Penland was pastor from 1845 to 1852; C. Foster Williams was pastor from 1853 to 1855; Abram Kline was pastor from 1856 to 1860; B. N. Sawtelle was pastor from 1861 to 1872; Mr. Brown was pastor from January, 1873 to June, 1873; Jorace P. Smith was pastor from 1873 to 1877; James G. Lane was pastor from 1878 to the present time. Messrs. Sawtelle and Smith died during their pastorate. In 1828 a Presbyterian Camp-meeting was held near LaGrange, Ala., and was largely attended, and a great revival took place. During Dr. Steadman’s pastorate there was a series of meetings held in the church by Rev. Daniel Baker, of Texas, resulting in a great religious awakening; also another in 1848 by Rev. Dr. Hall, and still another several years ago, when Mr. Lane was aided by Rev. J. W. Hoyte, and many additions were made to the membership. The Baptist Church.—This church was established in 1823, Elders J. Davis and Jeremiah Burns composing the Presbytery. J. Burns was pastor until 1832. John L. Townes was the next pastor, and filled the pulpit ten or twelve years. He was succeeded by R. B. Burleson, and he by Jackson Gunn. Rev. james Shackleford and his son-in-law, C. W. Hare, have filled the place since Mr. Gunn’s pastorate. The church building was erected by the Campbellites, or Christians, mainly through the personal efforts of Dr. W. H. Wharton, but it was not paid for, and the contractor. W. H. Patterson, sold his claim to George W. Carroll, who sold it to Edmund Elliott, a member of the Baptist Church. Through him the title passed to his church. The Methodist Church was organized in 1822 by Thomas Strongfield, then stationed at Huntsville. The first Quarterly Conference was held March 13, 1824. Alexander Sale was presiding elder, and David Owen and James Smith were local preachers; W. S. Jones was steward, and Richard Thompson class leader. In this year Rufus Ledbetter was assigned to the Franklin Circuit. In 1826 Finch P. Scruggs had charge of the Circuit. He died in Holly Springs, Miss., in 1881. At that time J. B. McFerrin, who died in Nashville a year or two ago, and who was editor of the Christian Advocate, and author of a work called “Methodism in Tennessee,” was a young preacher at this place. Mayor James Lockhart was an earnest and influential member of the church at that day, and it is said that he paid one-half of the expenses of it. Mr. McFerrin, aided by John Sutherland and Mr. Haynie, raised the money to erect the present building, which was commenced in 1826. Edward Stegar did the brick and Nelson Anderson the wood work. The first sermon was preached in the church by John Haynie in May, 1827. Rev. Mr. Shoemaker is the present incumbent, and the membership is about 250, being the largest in town, except that of the colored Baptists, which is over 500. During the pastorate of Rev. F. A. Owen, in 1828, the largest revival ever known in the church took place. St. John’s (Episcopal) Church. This church was built in 1852, mainly by Dr. William H. Newsum, who died in February, 1862. He donated the lot upon which it stands, and contributed more to build the house than any one else. The Rt. Rev. N. H. Cobbs was then bishop of the diocese, and his son, Rev. R. A. Cobbs, was the first rector, and remained in charge six years. The rite of confirmation in this church was administered for the first time on November 14, 1852, when six persons were presented by the rector. Upon the occupation of Tuscumbia by the Federal Army in 1862, they camped in this church and destroyed the large part of the register, in consequence of which a complete and accurate history of it can not be given to include the period between 1858 and 1866. Rev. George White, the venerable rector of Calvary Church, Memphis, Tenn., lately deceased, Rev. W. H. Thomas, of Maryland, and Rev. Mr. Whiteside were rectors during that period. On April 1, 1886, Rev. J. B. Gray, now of Washington City, took charge of the parish. At that time there were only fourteen communicants, some having moved away and others having died. Rev. T. J. Beard, now of Birmingham, was next in charge and he was succeeded by Rev. Peter Wager, who remained six years. Rev. B. F. Mower came to the south pastorate of the Tuscumbia and Florence churches in June 1878, and resigned in October 1887. The church building was much injured by the cyclone of November 22, 1874, and Mr. F. D. Hodgkins, his wife and four children were killed at the same time. Mr. Hodgkins was superintendent of the Sunday school of this church. Two handsome memorial windows in the church attest the loving remembrance in which they were held. The three chancel windows are memorials to Dr. W. H. Newsum, the founder of the church, and to his two sons, William O. and Alexander M. The former was killed at the battle of the Wilderness, May 6, 1864, and the latter died of yellow fever contracted in Memphis in 1878. There are also memorial windows for Mr. John Curry, and Mrs. Lou McFarland, Mrs. Emma Eggleston and Mrs. Maria Hicks. These windows are of stained glass, and the interior of the church presents quite a handsome appearance. This church is in the diocese of Bishop R. H. Wilmer, whose first official act in the church was the confirmation of a class of 12, presented by Rev. J. B. Gray, March 24, 1867. Rev. Mr. Phillips, of Baltimore, has recently taken charge as rector. The Catholic Church.—The commencement of Catholicity in Tuscumbia is associated with two families of the great Celtic branch of the commonwealth of nations. One was an Irish family, the other French. The name of the former is no longer anything more than a local reminiscence; the latter is still identified with all the active enterprises—religious, educational and social—of the growing town and its vicinity. Far from the influences attaching to the environment of the house of worship, and the accustomed and established services of religion, the heads of those two families, Mr. John Baxter and Dr. William Desprez, exhibited in their lives the teachings of their faith and how deep were the roots of their early religious training. Mr. John Baxter was born in Ireland and came early to this country. He died of apoplexy in 1874. A son of his, John B. Baxter, lives in New York. Dr. Desprez was born in Paris in 1806. He lived some years in Ireland and came subsequently to this country. He died in Tuscumbia of yellow fever during an epidemic of that disease, in October, 1878. He was a man of most upright character and sincere piety. He accomplished what is found by experience to be the most difficult, albeit the most important of all the duties of a parent; he educated his children so thoroughly in the knowledge and obligations of religion that they and their children are to-day [sic] the most prominent and edifying in its observance. Dr. Desprez married an Irish Presbyterian lady, sincerely and earnestly attached to her own faith, but who, seeing what a potent factor Catholic doctrine was in moulding her husband’s character and inspiring his conduct, could with difficulty believe that faith to be wrong, and consequently seconded his efforts in the training of their children in the religion which gave lustre to his own life. Shortly after the death of her husband, Mrs. Desprez embraced the Catholic faith. She still lives, surrounded by her children and grandchildren, honored and respected by her neighbors. The first Catholic Church was built in 1869, through the exertions of Dr. Desprez and Mr. Baxter, assisted very liberally by the non-Catholic portion of the community. The site upon which it was erected was donated by Mr. Baxter. It was solemnly dedicated, under the title of “Our Lady of the Sacred Heart,” on the 30th day of September, 1869, by the Rt. Rev. John Quinlan, Bishop of Mobile, assisted by several priests, and attended by a large concourse of people. Rev. Father John B. bassen, who is at present pastor of Pensacola, Fla., was the first pastor of the young community. This church was never fully completed, and it was destroyed by the tornado which did so much damage to the town in November, 1874. Father Baasen again built a small temporary chapel, still standing, and now used as a store-room by the Benedictine Sisters, where the people worshiped until 1878. In that year, the Rt. Rev. Boniface Wimmer, Abbot of the Benedictine Order in Pennsylvania, purchased from Father Baasen the house and property situated at the eastern extremity of the town. Rev. Matthew Sturenberg, O. S. B., was sent by the Abbot to take charge of the congregation. By his exertions a new church was erected, and, on the 8th of August, 1880, was solemnly consecrated, under the same title as the old one, by Bishop Quinlan, assisted by Rev. Benedict Menges, O. S. B., and Rev. Joseph Keeler, O. S. B. In the evening of the same day, the bell of the church was blessed by the Bishop. On February 24th, of the following year, four Benedictine Sisters arrived, and have since conducted the parochial school. They have also kept a few children as boarders. Their accommodation for this class of scholars has been and is still very limited, but the increasing demand will necessitate the erection of more extensive buildings. The Catholic congregation of Tuscumbia is increasing. There are two masses every Sunday, at 8 and 10 o’clock, and vespers and benediction in the afternoon at three o’clock. Every morning there is mass at 7:30 o’clock, at which the children of the parochial school attend. The Benedictines are established in perpetuum in the two counties of Colbert and Lauderdale, and, besides Tuscumbia, have churches and stations in St. Florian, Florence, Sheffield, Decatur, Huntsville, Cullman, Hanceville, Dickson, Courtland, Moulton and some minor places. They are hard workers, and self-denying men. The character of the men sent on these southern and arduous missions may be inferred from the fact that, when the Right Rev. Abbott Wimmer, a most ardent friend of the South and of Southern missions, died, the Pastor of Tuscumbia, Rev. Andrew Hinterach, Order of Saint Benedictine, was chosen as his successor to govern one of the most extensive religious Orders in America. Reverend Oswald Moosmuller, Order of Saint Benedictine, pastor of Cullman has been appointed Prior of the head house of the Order in Pennsylvania. He is the founder of the Industrial School for Colored Boys in Skidaway Island, near Savannah, Ga. By the product of his own literary labors and without collecting a cent, except two or three times having an innocent “strawberry festival,” which brought not much, he has accomplished what perhaps no other priest in America has ever done. He has built three churches; one at Skidaway for the colored boys and people of the island, and two at Savannah, one for white and the other for colored Catholics. Rev. Benedict Menges, Order of Saint Benedictine, for ten years identified with the missions of Alabama, has recently been appointed Superior of those missions, and will shortly reside in Tuscumbia. The development of the mineral resources and the growing industries of North Alabama will necessarily induce immigration and create a commensurate demand for educational facilities, and it is the intention of the Benedictines, as soon as circumstances will permit, to select a suitable site for a college, in which the youth of our own and neighboring States may, at little cost, receive an education to fit them for the positions and callings which may offer, and enable them to contribute to the future material and moral well-being of our city and State. The Deshler Female Institute is a handsome two story brick building on Main street, located in the center of the block or square which includes the residence of the late David Deshler, who bequeathed the entire property as a site for a female school. The building, which cost about $12,000, was destroyed by a cyclone in 1875, was rebuilt, and has been well patronized and is now in a flourishing condition under the management of Mr. Dell. It is called “The Deshler Institute,” in honor of General James Deshler, who was a native of Tuscumbia and a graduate of West Point, and was killed in the late war at the battle of Chickamauga. The city council have recently appropriated $6,000 for the benefit of the public male school for the whites, which will put it on a good footing. In addition to the above there are several smaller private schools. Source: This is a reprint from Northern Alabama Historical and Biographical Illustrated 1888 Smith & DeLand, Birmingham, Ala.,VII. Sheffield, by William Garrett Brown. especially from the far distant past are always welcome. This photo is of four Confederate Veterans at a reunion in Macon, Georgia in 1912. 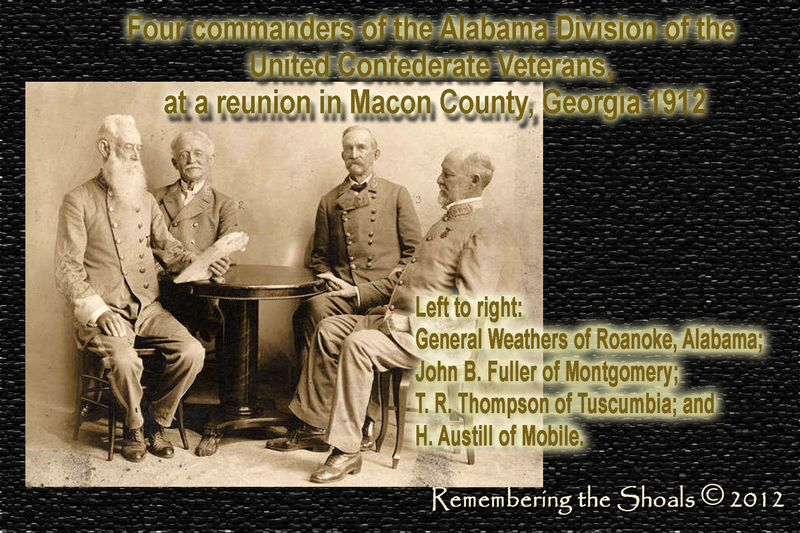 These handsome men include T. R. Thompson from Tuscumbia, Alabama. and her two children. I am not able to name the children. Ora Lee Posey was a sister to Orval Posey. Jessie A “Jay” and Alice Posey were the parents of Jessie Dee Posey, Orvel H Posey, and Ora Lee Posey; there may be more children that are not known currently. Jay and Alice Posey lived in Sheffield as long as I remember. Dee Posey was on the police force, in Tuscumbia, if I recall correctly. Orvel H Posey married Willie Preston Peebles and lived for many years in Steenson Hollow in Muscle Shoals. cigarillos? Somebody must have wanted cigarettes or cigarillos, but somebody got them some Peanut instead the other night, and not in a good way. We call him Peanut. And we love him. Everybody loves Peanut. And everybody wants to know the answer to our burning question. WHO did this to Peanut? WHAT did this to Peanut as to do something as heinous as this had to be a what and not a who. Pray for Peanut and his speedy recovery. The other night Peanut was assaulted, rather badly, and then he was dumped out to live or die in the Spring Valley community of Colbert County, Alabama. How many of you have given Peanut a ride somewhere? Stand up. Right now. Testify. With little doubt you likely gave him a little something something to put in his pocket as well. We call him Peanut, but we could just as well call him Mr. Light and Sunshine. For helping him along his way always provides the grantor a little light and sunshine in their day. The Shoals area has always been one big neighborhood when it comes to protecting and providing for the defenseless. Do you remember Marvin from downtown Sheffield? Do you remember Barney who walked everywhere and rather rapidly if I recall correctly? And there have been others. Can you recall Barney and that he seemed to lean forward and his speed when walking was a clip? I had always thought his fast walking was for exercise benefits. After Barney died a nurse told me that it was miraculous that Barney could even walk. She did not see how he could walk. At the time of his death she saw his feet. From her facial contortions as she described his club feet, it was evident that they were gnarled knobs, not feet. They were not feet that would be comfortable to walk on, yet he did walk. He walked everywhere. From Tuscumbia to Sheffield, then from Sheffield to Tuscumbia. In Cherokee, they adopted Donald Thompson. Donald was a huge Alabama Crimson Tide fan, likely the biggest fan of Alabama ever born. He loved sports, but was not healthy enough to play. So, he did the next best thing. He helped the coaches. At his funeral not so very long ago, someone remarked they had never seen so many big hulking athletic types, many coaches, seated all together on pews and everyone of them either sobbing or trying to hold back the sobs. He was beloved. They were beloved by him. Now the hearts of the Shoals, the one great big neighborhood, belongs to Peanut. Peanut is beloved by almost everybody who meets him. And he loves them right back. ﻿﻿﻿﻿﻿The local news reported on the incident. The report is here. Stephen Michael, who is referred to as Peanut by those who love him, is reported to be forty-six years old, is with his seventy-year-old mother in the photo that accompanied the report of the incident. There are unverified reports that the perpetrator was laughing about the incident in public. baseball team. Pictured first row left to right: Lucian Hamlet, W C Olive, Clyde Lamb, Irl Arthur, W B Harris. Second row left to right: T C Blackwell, S M Chaffin Jr, Malcolm Smith, E M Williams, G W Williams, Luke Hendricks, Charles White, H K Allen, J N Winston and R R Martin. it’s cold outside! The photo is of Kris and Krista Burden of Tuscumbia, Alabama. are the people in this photo, but when I see this photo all I see is HER mother and HIS father.